What is CO2 Laser Cutting? A carbon dioxide laser cutter is used to cut a sheet of metal. CO2 laser cutting is a process whereby materials are cut using a focused, high energy beam of light generated by a carbon dioxide laser. The laser beam is focused into a very precise spot on the material to be cut, and the heat generated forms a small, localized melt point through the entire thickness of the material. 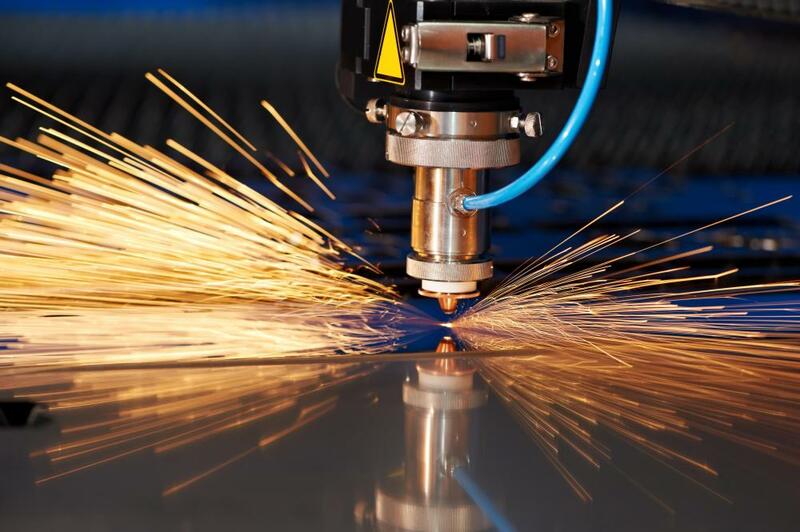 Many CO2 laser cutting machines employ a gas assist system which focuses a high speed stream of inert gas onto the cut point to clear the cut of melted material. Most laser cutters are automated and advance the cut by either moving the cutting head or the material to follow the cut profile. CO2 laser cutting is used for a wide range of materials and is characterized by high cutting speeds and extreme cut precision levels. Laser cutting offers operators a highly accurate method of cutting complex shapes from a wide variety of materials. 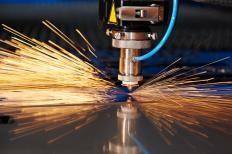 Lasers can be focused to extremely fine points and have enough energy to cut through thick metals with ease. Computer aided design (CAD) and computer numerical control (CNC) technology allows complex designs to be made by automated CO2 laser cutting machines quickly and with great accuracy. The list of materials suited to laser cutting is diverse and includes ceramics, plastics, metals, wood, and rubber. Carbon dioxide lasers are the most powerful continuous wave laser types available with even moderately powered examples able to effortless cut through 2 inch (60 mm) thick steel plates. A good example of the capabilities of CO2 lasers is the average steel stock thicknesses cut commercially; these run between 3/4 of an inch and 1 inch (20–25 mm). Utilizing light emissions in the 9.4 to 10.6 micrometer infrared wavelength bands, CO2 lasers are not only powerful but efficient and have enough output to pump power ratios as high as 20%. The machines also feature high cutting speeds; rates of 460 feet per minute (140 m/min) are possible on thin materials. When metals are cut with CO2 laser cutting equipment, a gas assist system is typically employed to ensure continuous cuts with no feathering and little post-cut clean up requirements. This system employs a high pressure jet of inert gas directed at the melt point during cutting. This clears melted material from the cut as well as increasing the thermal efficiency of the laser on certain materials. The CO2 laser cutting process is achieved by either moving a three-dimensional, gantry mounted laser head across the workpiece or by moving the workpiece around under a static cutting head. What Are the Best Tips for Making Laser Cut Plastic? What Is Laser Beam Machining? What is Involved in Laser Cutting Plastic? What is Involved in Laser Cutting Steel? What is Involved in Laser Cutting Acrylic? What are the Different Types of Laser Cutting Equipment? What are Carbon Dioxide Lasers?